I live near the Concert Hall and drive past it nearly every day. It was exciting to watch the construction of this unique and wonderful building. When I decided to do this design, I knew it would be a challenge so I went early one morning to look carefully and find my point of view. The idea I got that morning was as if someone had dropped a musical score and the loose pages were dancing and swirling joyfully in the morning breeze. That is the goal I hoped to achieve with this design, to make the Concert Hall dance and sing as it truly does. 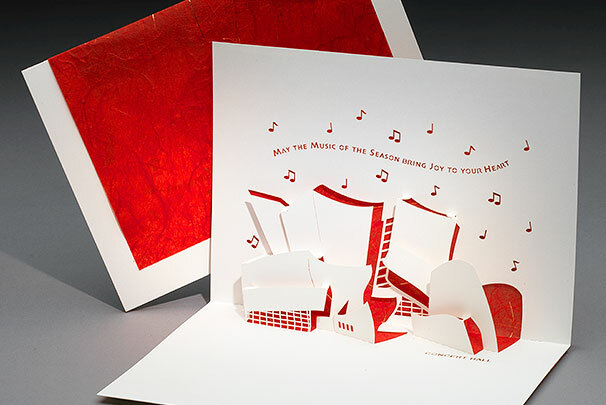 Text reads "May the Music of the Season bring Joy to your Heart".